After just having gone through a long winter I think it is time to start celebrating! How many times do we "wait" to do the "fun" things in life? Most of the time it seems like the "extra special" fun things are done on the weekend, BUT this does NOT have to be the case! How about spicing up life with a little mid-week fun! Instead of waiting for Saturday to come I decided to have a outdoor cookout on Wednesday! It was such a enjoyable and relaxing time, no fuss, much laughter, and some good memories. 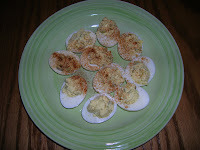 Of course, no cookout is complete without some deviled eggs! These are the first of the season and boy, were they yummy! Uh, oh, I went a little too crazy with the paprika, but they still tasted delicious! 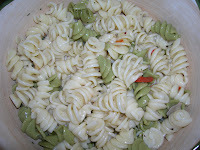 We also had some pasta salad to go along with our baked beans and hamburgers. Buster and Bailey had fun, too! 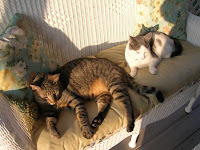 After all their playing and running around they decided to take a little "cat nap" and enjoyed the last few wonderful rays of sunshine. To end this most wonderful day we were treated to a beautiful sunset. As most of you know I had decided I wanted to "name" my porch. I call it Willow View and this picture shows you exactly why. 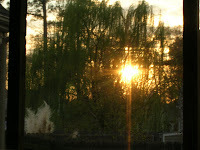 Isn't the sun shining through the Willow Tree pretty? So, what are you waiting for? See what kind of mid-week fun you can come up with! I promise, you will be so glad you did! 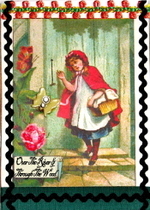 We've had rain and gloomy skies here today. I like this mid-week idea. The food sounds like it was delicious, and I would love to be sitting on your Willow View porch, enjoying the setting sun, with you and the kitties. Well, that was a good idea! A nice way to get past the mid week blues. 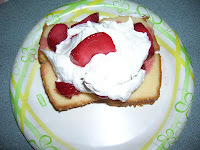 It all looked yummy, especially that strawberry shortcake:) I just love the view from your back porch, I think I would sit out there every night. It just looks so peaceful. Enjoy the rest of your week! What a wonderful idea!!! And your menu is just mouth-watering!! What a blessing for your family! 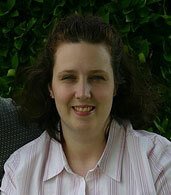 And I think Willow View is a perfect name for your porch.--What a lovely view!